Despite the fact that it probably seems like I survive on an unhealthy diet made up almost entirely of sugar, that couldn’t be further from the truth. I survive on an unhealthy diet made up almost entirely of artificial sweeteners. And while that isn’t entirely true either (don’t worry, eventually some things I say in here will be true… probably), it is a sad fact that chemicals make up a large portion of what I ingest. And to that potentially frightening fact I say, “Eh.” I figure, although maybe “hope” would be a better word, that the extreme aspects of my weird diet will do their best to cancel each other out. Yes, I may drink countless cans of chemically-infused diet sodas a day, but I also eat about a pound of vegetables a day. So we’re even. Regardless, my contrasting attitudes towards health have seemingly come together into one, glorious product: Diet Coke Plus. Essentially, it is Diet Coke with vitamins and minerals added to it. I had doubts going into trying it. I’m not a huge fan of Diet Coke. That sounds odd, considering how much of it I drink, but that is more a result of lack of choices. It’s the default diet soda in most restaurants, as well as in theme parks and sports venues. So while I am not a huge fan of the food or the three hour waits, this is one reason why The Cheesecake Factory is amazing: they have Fresca on tap. That alone always gives me a spark of hope for the future of humanity. Given my rather indifferent feelings towards Diet Coke, the idea of adding vitamins didn’t sound like a sure-fire way to improve the taste. I’m not sure if you have ever chewed on a Centrum (I have, but it was by accident, which makes it a slightly less ridiculous thing to say), but they’re not exactly delicious. So Diet Coke + bitter vitamins = good? I was already beginning to doubt the plus in that equation. Or maybe it’s the equals sign that makes it incorrect, I’m not sure. Although the soda is called Plus, so I’ll go with the former. After tasting it, I was hit with a weird realization: it tastes better than regular Diet Coke. This is because they use a sweetener combination of Ace-K and aspartame, not just plain aspartame. This combination is used in one of my current favorite sodas, Coke Zero. It is a good combination in terms of taste; it makes diet sodas taste a bit sweeter, but with a more natural flavor and not the typically harsh sugar free sweetness. I didn’t notice any bitterness from the added vitamins, which was a good thing. At the same time, I can’t say I enjoyed it all that much. It still has that bland Diet Coke flavor, only with a slightly sweeter taste. As for the vitamins and minerals, I’ll stick to taking multivitamins. So, unfortunately, even though “stupid soda ideas with short time frames before they disappear” are so beloved by myself, Diet Coke Plus wasn’t too interesting. It certainly wasn’t bad, and if someone had it around, I’d have some. However, I doubt I would actually purchase or order it myself. It’s safe to say the only time I will be using the words Diet Coke Plus when ordering a drink, is when that phrase is immediately followed by the word “rum”. 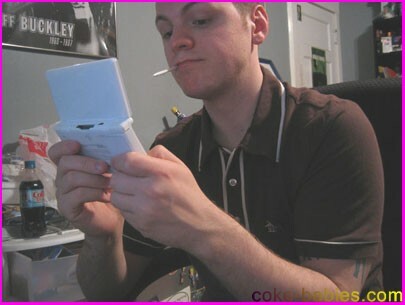 Since this article is depressingly lacking in visual aids, here is a picture of me playing Pokemon Diamond. The Diet Coke Plus is in the background. I would have taken a solo picture but, sadly, my shelf was too messy.